Wall Speedway in New Jersey is, arguably, the driver’s worst nightmare. It is also, arguably, a videographer’s and photographer’s paradise. With all that being said, I didn’t actually love Wall entirely as much as I thought I would have. As far as angles go, the place is absolutely amazing. Within about a 5 minute walk is every good location you can think of, so getting around is absolutely no problem. Believe it or not, the only issue I had with Wall Speedway was actually brought on by two things, which were really quite out of anybody’s control: thick smoke, and lack of wind. With my tendency to like shots that are really wide, it made for some difficulty picking good spots due to the smoke that would basically hang in the air like mist. It was easy to see why Wall is not a favourite amongst the drivers. Apart from the most obvious bit, the nasty steel wall looming over the insanely steep bank, Wall is not exactly a smooth Sunday drive. Plenty of cars would nearly bottom out coming off of the bank, and others would be bouncing around furiously over the recently paved middle section of the track. With my brother Pat Cyr being out of commission within 5 laps of practice, and other drivers also breaking or crashing, it should come as no surprise that I titled this particular video ‘Survival’. With the practice day being cut short by the crazy torrential downpour, and my having to leave before Top 16, I felt a little bit hard pressed to shoot things, and found myself feeling like I was short on footage. Still, I was amazed when I got home to find plenty of really good footage for a video, reminding me that it’s pretty hard not to get good shots at an FD event. 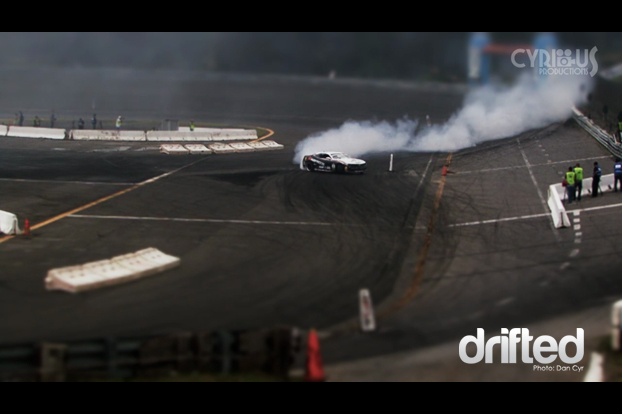 Anyway, I hope you enjoy, and come back to Drifted.com for more FD coverage soon, and maybe a little sprinkle of Drift Mania Canadian Championships as well! !